Friendship bracelets are generally made using macrame, a style of textile production using knotting rather than weaving. There are many ways to tie your bracelet onto your wrist once you are finished. While the simplest method is to leave yourself extra string at the ends and tie using a simple overhand knot, you can give your bracelet a much nicer looking loop tie. The bracelet itself will have two small holes and a "tail," which passes through these two small holes as a way of tying the bracelet onto your wrist. Place two strings parallel to each other. Now tie several macrame knots (also called square knots). 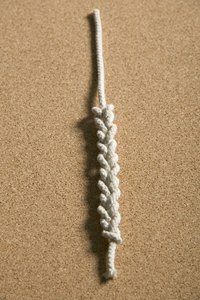 To tie a macrame knot, use 4 strings. For this project, begin in the middle of the strings. These two strings will be the center around which your two other strings will form the macrame knot. Take your 3rd string and cross it under the center strings. Cross the 4th string under the 3rd string, over the center strings, and again under the 3rd string. Now bring the 4th over the center strings and under the 3rd string. Bring the 3rd string under the center strings and through the loop now created by the 4th string. Continue until your macrame chain is 4 centimeters long. Bend the macrame chain on itself so that it forms a loop. Now continue to macrame with the 8 strings. Tie the inner two stings using a simple overhand knot. Take the outside string and tie a single loop around the adjacent string. Then take that same string and tie a loop around the next string, and the next string. Do the same on the other side. Once you have moved both outside strings together tie them together. Repeat step 2 until the bracelet is 4 centimeters less long than the circumference of your wrist. Tie a gathering knot to bring all the strings together. If you do not know a gathering knot you can either tie a simple overhand knot using all the strings together, or you can omit the gathering knot. Pull four strings to the left and four strings to the right. Using the macrame knot make both chains 2 centimeters long. Pull the 8 strings back together. Pair string up with one another so that you have two strings functioning as one. Tie normal macrame knots letting two strings fulfill the role generally fulfilled by one. Make this section about 3 centimeters long. Tie a big overhand knot with the remaining thread. Place the end knot through the start loop to tie the bracelet around your hand. Pull the bracelet tight and bring it back into the second loop.